HOME > Reservations: Reservations • Travel Insurance • Cancelation • Cook Service • AND MORE! We are here to offer our suggestions and recommendations to help you select the perfect vacation rental. We have seen all properties and we've stayed in many. We've stayed in villas in town; we've laid our heads on the pillows in luxury beachfront villas; we've made ourselves at home in various oceanfront condos. I guess you can say that we sleep around a lot! So we are very familiar with the properties that we offer. Poke around and get familiar with the wide assortment of properties that we offer. And, don't be afraid to ask us for our recommendations. We'd love to match you up with the perfect vacation rental property. We know that if you have an epic vacation experience, you'll return again and again. Once you have selected the perfect property, we'll make the reservation process as easy as pie. or call us at 406-686-9169 or toll free 866-564-4427. If the property is available, we will block your dates on the calendar. To confirm your dates, we need a deposit of 50%; full payment is due 45 days prior to arrival. Some properties may require final payment 60 days prior to arrival. Upon full payment, we will send you a final confirmation with directions and instructions for check-in. We'll provide contact numbers, lockbox codes and anything else that might be needed. Some (not all!) properties require Saturday to Saturday reservations during high season (Dec. through April) and holidays. Most properties are available for less than 7 nights, but may have a minimum of 3, 4 or 5 nights. A refundable security deposit or a nonrefundable damage waiver may be required. Security deposits are refunded within 30 days after departure if there has been no damage. We hope you'll send us some feedback after you return home from your vacation. We want your honest opinion and we welcome your comments and suggestions. On a personal note: We have purchased travel insurance ourselves and we have had to use it. We found that AIG was very responsive and we were compensated quickly and without a lot of red tape. We were VERY thankful that we had the foresight to invest in coverage. 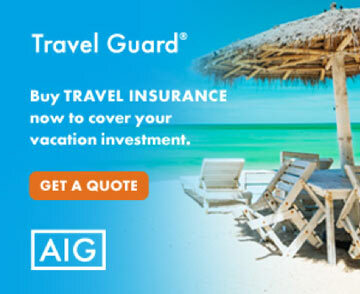 The investment in travel insurance saved us THOUSANDS of dollars! It was well worth it! We hope it doesn't happen, but if you need to cancel your reservation for any reason, please let us know as soon as possible. And, hopefully, you WILL have travel insurance! If you do not have travel insurance, of course we will do our best to rebook the property so we can issue a refund. If we are able to rebook the property for the same exact dates and same rate, we can offer a refund (less $150 to $250 cancellation fee and credit card fees). Please realize that the earlier you cancel, the more likely that the property can be re-booked. If you cancel at the last minute, we will often cut the rental rate to attract a booking. If this happens, your refund will be deducted based on the difference between the full rate and reduced rate. In most cases, last-minute cancellations do not get re-booked so refunds will not be issued. We do our best, but we can't predict whether the property will be rebooked or not. If there is a rate increase after you have made a deposit, rest assured that the rate on your contract will be honored. Holiday dates fill VERY early, especially New Year's Week, Christmas, Thanksgiving, Easter and spring break. These dates can fill in these properties a year (or more!) in advance. Please book early for best selection. Please note that occupying both Christmas and New Year's day requires payment of two weeks (14 nights) at holiday rates. Most properties offer lower rates during the off-season (May through December); rates are posted on each individual villa/condo page. Maximum Occupancy, Unauthorized Guests, Onsite Support, Maintenance, Etc. All properties have restrictions on the number of guests that can be accommodated. You do not want to over-crowd your villa or condo or you may not have enough water, towels, etc. ; and you could be faced with extra charges. When you make your reservation we need to know how many people will be in your party. If that number changes, please inform us. Be aware that properties do not allow unauthorized guests, visitors or service personnel (including independent cook services). Inviting unauthorized visitors to the property for parties, dinners or ‘get-togethers’ or unauthorized personnel (including independent cook services), may result in a forfeiture of your security deposit or other actions (see more below on that). Please, if you expect friends to visit during your stay, contact us well in advance so we can get approval for you. Please note that each property has a designated or approved cook service staff; other services are not permitted. We’d like to explain why other cook service providers are not allowed in private villas and condos. More and more independent cook services have sprung up; some of these might be wonderful and great. But, it has become a growing concern for owners and managers because there have been some problems. It can be a security issue when unknown individuals are granted entry to a property; these unknowns may have access to keys, entry codes, etc. Owners and managers do not want any safety issues for guests, so they do not want to risk that keys or codes will fall into the wrong hands. And, owners and managers are protective of their properties. Recently, guests invited unauthorized cooks into a property and that staff caused over $500 in damage because they were not familiar with the equipment in the kitchen. For that reason, owners and managers allow only approved staff. The renter named in the agreement will be responsible for themselves and all guests whether they are registered in the villa or not. The renter acknowledges that Tropical Island Connections, LLC, its owners, employees and agents do not carry personal liability insurance and cannot be held responsible regardless of fault, for any accident, loss, damage or injury suffered by the renter, members of their party or any other guests which the renter or their party have allowed access to the property, regardless if said loss is a result directly or indirectly from acts of god, danger related to the sea or any body of water, fire, breakdown of machinery, strikes, pilferage. Furthermore, the renter will release and hold harmless any and all parties involved with the rental, management and reservations of the property and to release and hold harmless its owners or representatives for any loss or damage to personal property or for any injury or even death. Onsite staff and management company do all they can to ensure that your stay is happy and comfortable. They are available to answer any questions or concerns that you might have when you arrive. And before your visit, they will do their best to make sure that everything is working properly. However, even the best and newest equipment occasionally malfunctions and cannot be guaranteed 100% of the time (even in the US!). If you have any problems at all, please contact the onsite staff as soon as possible and they will make sure problems are corrected as soon as humanly possible! If there is a maintenance issue, the manager or authorized personnel may enter the premises during business hours in order to facilitate the repair or maintenance. Please understand that there will be no refunds or discounts offered or expected for issues that are out of our control such as breakdown of air conditioners, TVs, DVD players, electronics and appliances, satellite/cable television, telephone, internet (including loss of signal), construction nearby, electrical outage, beach accesses unusable due to acts of nature, a home not decorated to your tastes, bad weather, disturbances by neighbors, or beach access location or other circumstances beyond our control. But do know that staff is there to handle maintenance or repairs. You can expect prompt, professional and courteous attention. In the event that a property is rendered unavailable due to hurricane, flood, fire, unexpected major repairs or maintenance, sale of the property or other reasons, Tropical Island Connections, LLC shall be held harmless. If, for some reason a property becomes unavailable, Tropical Island Connections, can help to reschedule, find another property or offer a full refund. If there is a difference in rates for rescheduled dates or an alternate property, the additional rate is the responsibility of the geust. We STRONGLY RECOMMEND that you purchase trip insurance with a clause that will provide a full refund for this type of cancellation. If we can be of any further assistance or if you have any questions or concerns, please contact us. What is the 19% IVA tax and when does it apply? The 19% local fees, or tax, is collected by the Mexican government on all tourist rental properties, including hotels, villas and condos. This fee is not included in the rates quoted so please make sure to add it on when calculating the total rental amount. What can I expect when renting a villa or condo? You'll have much more private space and freedom with a rental villa or condo than a hotel or resort setting. All units have just-like-home living spaces including living room, bedroom (s), dining area and fully equipped kitchen (unless noted). You can relax in your home-away-from-home. Villas and condos are completely furnished, including all linens, bath towels, cooking utensils, etc. Some properties supply beach towels, other do not (see list of amenities on our website or ask us). You don't need to clean or do dishes; maid service is provided. DO drink the water . . . we provide purified bottled water for you! A representative is in the area to greet you upon your arrival. Our representative is available throughout your stay in case you have any questions. If you would like to have a cook in your villa or condo, we can make arrangements. Just let us know and we are happy to set that up for you. Oceanfront/beach area properties offer spectacular ocean views or access. Because of location of these properties, you may want to have a rental vehicle. Many of the oceanfront/beach area properties have excellent snorkeling right in the area. Property size varies from 1 B.R. to 11 B.R. If you have a larger party, you can choose from a number of villas close to each other that could be combined for groups. Most villas have restrictions on the number of guests that can be accommodated. You do not want to over-crowd your villa or condo or you'll run into problems (you may not have enough water, towels, etc. ); and you could be faced with extra charges. When you make your reservation we need to know how many people will be in your party. If that number changes, you need to inform us. Cook servcie is a great way to sample authentic Mexican and Yucatecan cuisine. Cooks can prepare 2 meals per day, including breakfast and lunch or dinner during a week's stay (5 to 6 days per week). Meal service rates vary, depending on the property you choose. Weekly rates vary from about $175 to $220 per person per week and half price for children 9 and under (no charge for children under 2). This includes the cost of the food, preparation, service and clean up. The price does not include beverages or tip for the cook. If you wish to have the villa stocked with some basic grocery items or beverages, a service fee of 20% to 25% is applied. Note that owners and managers of private villas and condos have their own meal service providers. Unauthorized meal service providers are not allowed. Why should I make a reservation with Tropical Island Connections (cozumelvillas.com)? We truly appreciate your business. We work hard to respond quickly and professionally to e-mail and telephone calls. We answer e-mail and phone calls 7 days a week, virtually 365 days a year. You can rest assured that we see the properties that we represent. We make it a point to view each condo and villa on our website so that we can give you our personal input. If we like one property over another, we will be honest and tell you. We take our own photos of the properties and they have not been enhanced in any way. What you see is what you get. We offer the largest selection of properties on the island. We don't, however, offer EVERY property. We include properties which have reliable management companies who will be responsive and provide dependable services to guests. We don't try to mislead you with information. Some websites try to paint a prettier-than-the-real-picture scenario when describing properties. We won't tell you a property is "luxury" unless it truly is. If a property is basic, we'll tell you. Property management companies may feel obligated to book the properties that they manage, which is understandable. We have no bias in that regard. We do give higher recommendations to the properties that offer the most amenities, good locations, pleasant decor, reliable management services and best value. We have stayed in many of the properties that we represent so we know there is a difference in comfort levels and we're happy to give you our personal opinion. You can be confident that we know the area. We spend a lot of time on the island and know it well.